Coming across street art in New York is not exactly hard. There is plenty of it but if time is limited here are 4 areas you should make sure you don’t miss. 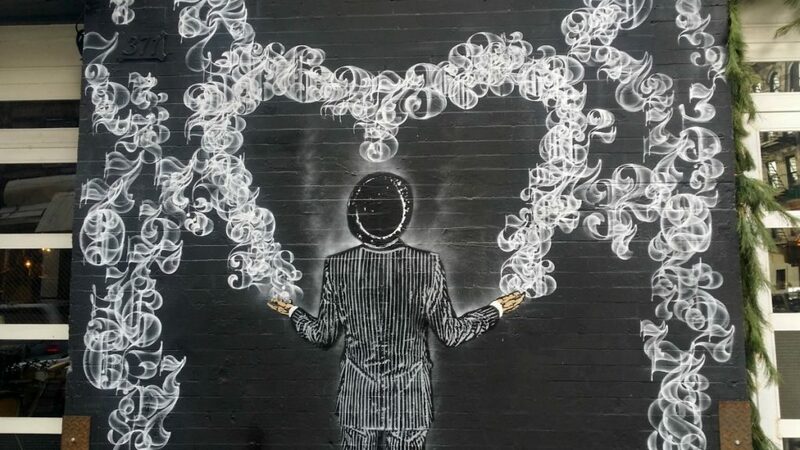 On my visit to New York in 2014, I discovered some fantastic street art during my 4-day stay but it was a last minute business trip and I did not have much timr to explore. So when Charlie and I planned our next visit I did lots of research, made my own Google map and even found a few great street art walking tours to join. I also discovered some interesting local projects worth checking out. On this 10 day visit to New York we spent 2 full days exploring the walls and murals in Manhattan and Brooklyn. The street art scene in this city is one of the best in the world. We covered a lot of ground but there is still plenty left to find on our next visit. For the murals included here I have tried to include the name of the artist where I could and also give you an address so you can find them on your visit. L.I.S.A is a non-profit organisation that has been bringing murals to Mulberry Street since 2012. Over the last five years, more than 80 murals have appeared, created by a diverse group of street artists. The art now stretches into SoHo, Lower Eastside, East Village, Chinatown and Chelsea. Many locals suggest the project has helped to revitalise the area. I have been trying to choose a favourite Little Italy mural and it’s hard to go past the work of Tristan Eaton. Eaton is a Brooklyn-based artist whose work has so much energy, it feels like the colours are jumping off the wall right at you. The image above “Big City of Dreams" was painted in 2014 and was partly sponsored by Guess jeans. Part ad, part mural, always a little controversial. I would be quite happy if all advertising were this creative. 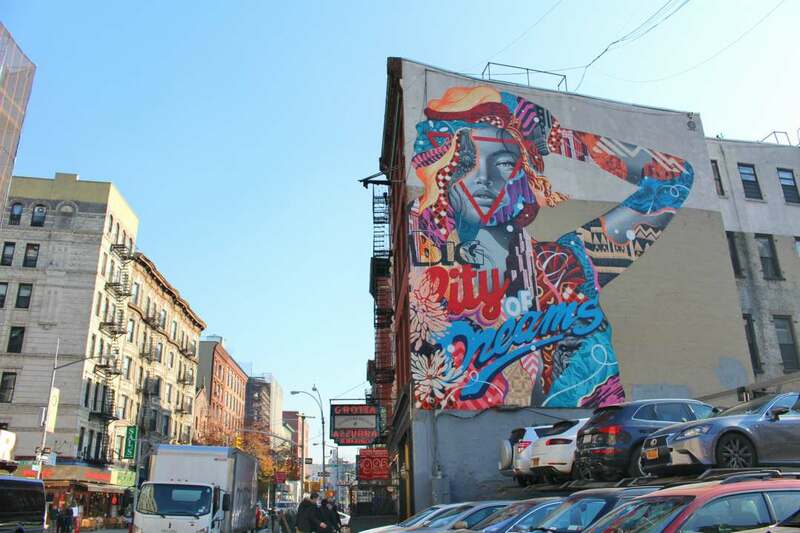 You can find the mural on Broome Street in Little Italy. 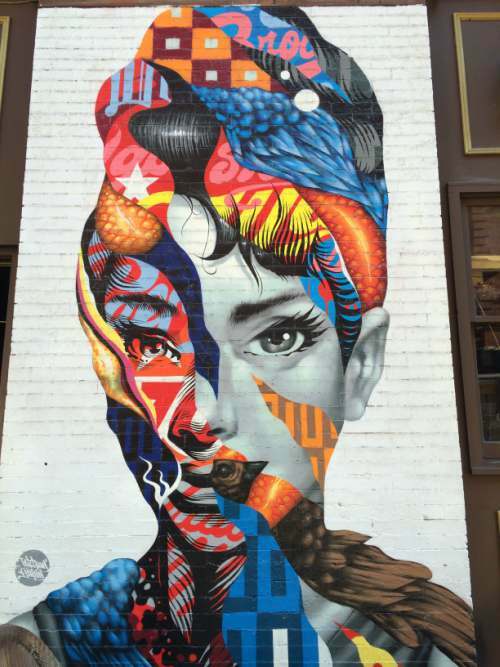 The mural of Audrey Hepburn below is another local favourite. 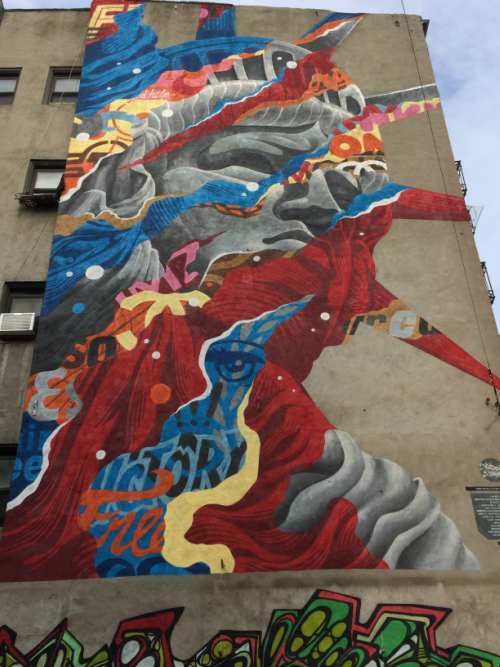 It was painted in 2013, the second year of the L.I.S.A. Project. You will find this on the side of Caffe Roma on the corner of Mulberry and Broome Streets. The final Eaton piece here is called Liberty and mixes the iconic lady with themes of American culture. 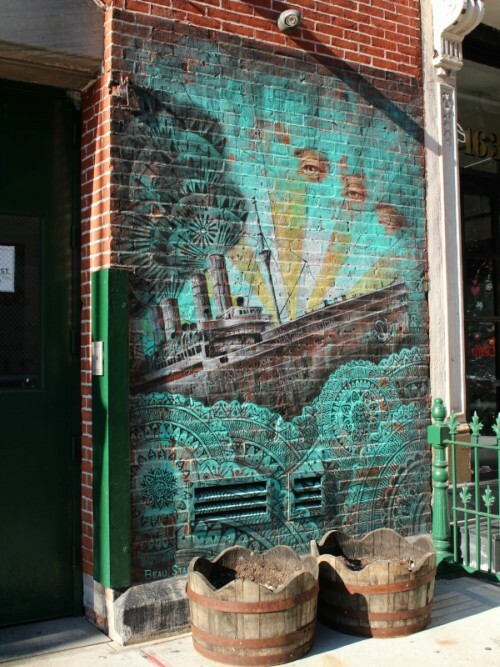 Liberty is on the corner of Mulberry St. and Canal St.
Moving below is this gorgeous old ship titled “Cursum Perficio” by LA-born, Brooklyn-based artist Beau Stanton painted in 2013. 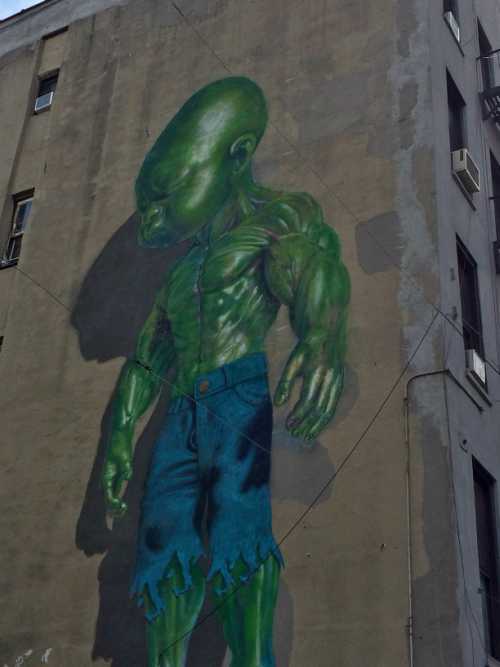 This one is at 163 Mulberry St near the corner of Grand St.
Perhaps one of the most Instagrammed wall in the area is Temper Tot by Ron English. This is right across from the Liberty mural at 114 Mulberry Street in Little Italy. There is also a pink version nearby. I knew I wanted to spend more time in Brooklyn on this trip. Last time I was here I had stayed in Prospect Heights and really loved the area but as it was a very short visit I did not make it to the other side of the borough. We discovered this tour online before we left Sydney. I had taken a couple of tours with Free Tours By Foot back in 2014 and both were excellent so this trip we actually planned a couple of days around fitting in these tours. These tours operate with a pay what you think its worth model. You pay a tip at the end of the tour based on how much you enjoyed it. I have now done 5 tours and I would highly recommend them to anyone. Our guide started the tour by giving us some background on the street art movement in NYC and then went on to explain the various types of materials and techniques popular today. I enjoyed learning more about each mural, the how and whys, and also to find out some more about the local artists. The image above “#Fight for Street Art” by Eduardo Kobra featuring Jean-Michel Basquiat and Andy Warhol is a favourite of mine. 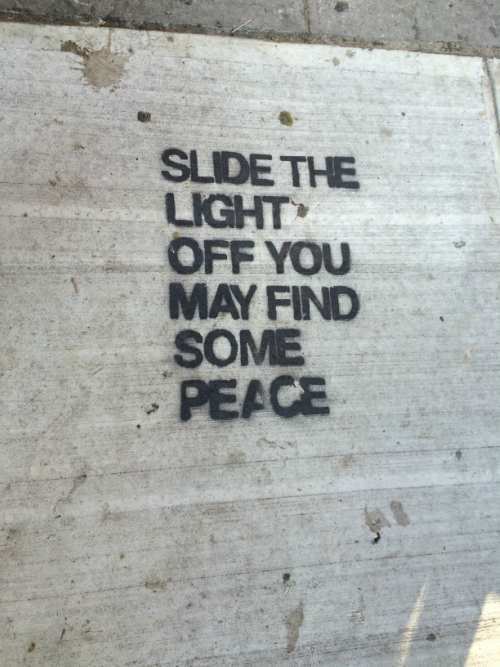 You will find it on the corner of Bedford Ave and North 9th Street. Kobra’s work often features famous people – keep an eye out for them on your travels. I love the ones of Anne Frank (Amsterdam) and Einstein (LA, Brazil), all his work is pretty special. I was sad to see that his large scale mural near the highline “The Kiss” which was based on the famous photo of a sailor kissing a nurse at the end of the war is now gone, painted over by the owner. I thought this stencilled message on the pavement was on the money – so many of us walk around snapping away without taking the time to really look at what we are seeing, we are too busy instagraming it or making sure we have a shot for Facebook. Our guide was not sure who the artist of this piece was but said he thought it was a local. I was amazed at the realism in this mural by Italian artist Jorit Agoch. It was impossible not to stop and take it in. It is apparently a portrait a boy called Camilo who had an Italian father and a Jamaican mother. Much of this artist’s work features large-scale pieces that focus on the face. Unlike a lot of street artists, Jorit studied Italian classical art in Naples and lists Michelangelo, Leonardo and Caravaggio among his inspiration. I think they would find his work pretty impressive. 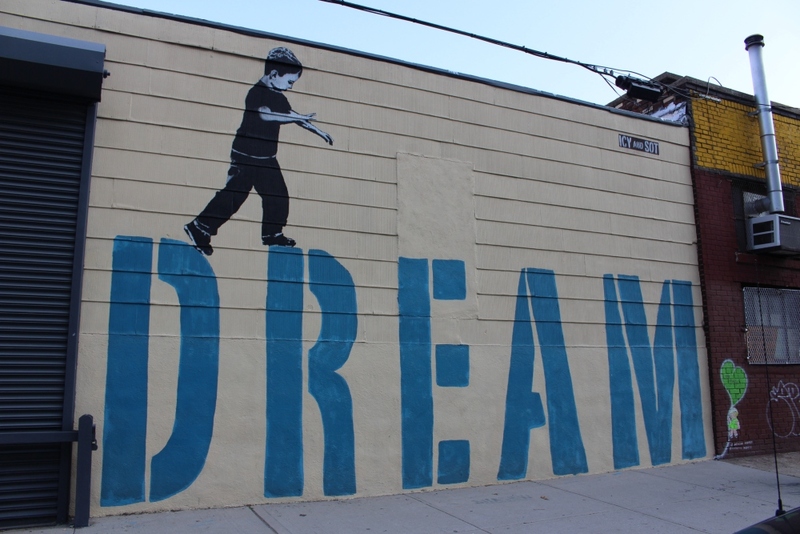 You will find the mural below “Dream” painted in 2012 by Iranian street artists Icy and Sot on North 10th Street. 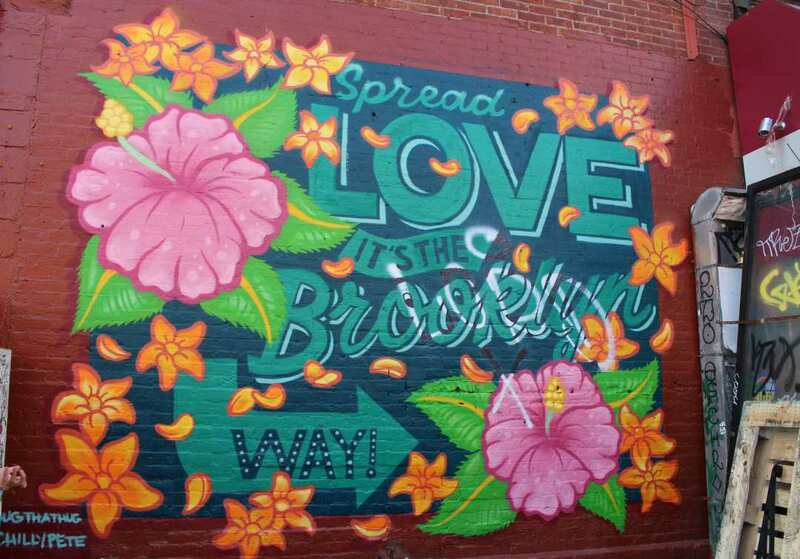 The mural below “Spread the Love it’s the Brooklyn Way” by @dougthathug @chillypete is painted on the wall of the Bedford Fruit and Vegetable store at 167 Bedford Street. 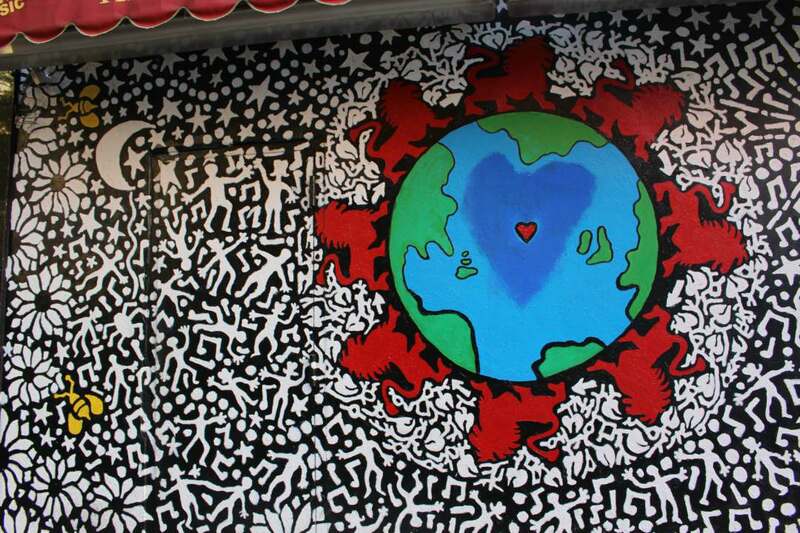 The mural above “Spread the Love it’s the Brooklyn Way” by @dougthathug @chillypete is painted on the wall of the Bedford Fruit and Vegetable store at 167 Bedford Street. If you don’t have time to do a tour you could easily take the L train to Bedford and walk the streets immediately surrounding the station. Particularly good streets are Bedford Ave. and Nth 7th Street along to North 10th Street. There is lots of great food and even a local brewery for sustenance. The focus of our visit to Harlem was food and music, however, the walls here were too hard to ignore. We took the train to 125th Street and did another Free Tours by Foot tour – this one was a Harlem history and Gospel experience and it was brilliant but I could not help but notice all the art and wished I had more time to explore here. I will certainly be back next time to check out the Monument Art project in East Harlem. 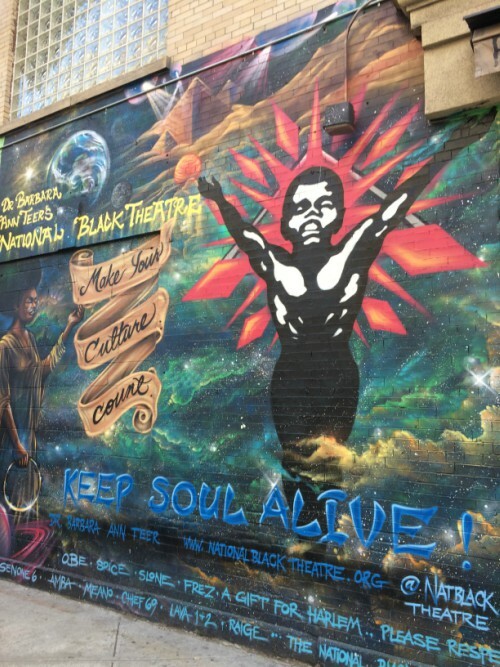 The mural above is one section of the huge work on the side wall of the National Black Theatre at W 125th Street on the corner of 5th Ave. It was completed as part of an event hosted by DC-based non-profit group Beats, Rhymes and Rythm. 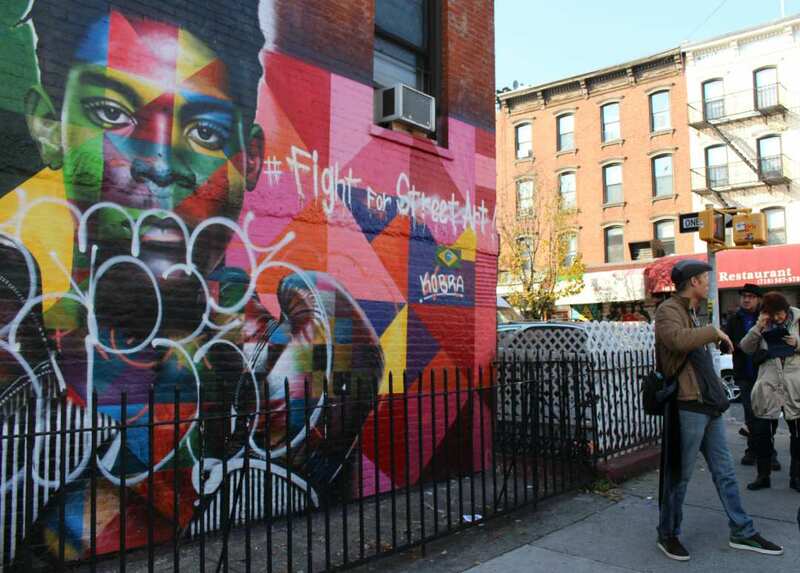 The almost 30 metres long wall has three distinct parts, one focusing on the heritage of the Black Theatre, the middle on hip-hop culture and featuring Afrika Bambaataa and the last (above) dedicated to people who died as a result of violence. If you are interested in knowing more about the project, there is a video of the event you can watch on Youtube. 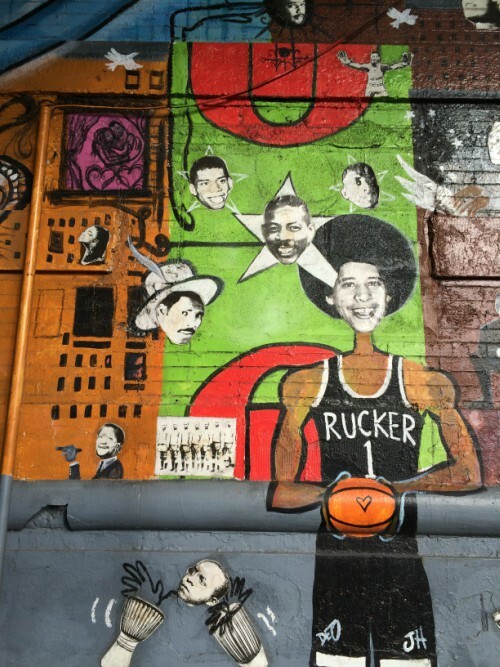 The mural below Planet Harlem by Paul Deo, is just a short walk from the theatre Planet Harlem. It honours Harlem’s greatest including Jimi Hendrix, Micheal Jackson, James Brown Maya Angelou, Malcolm X, Mohammad Ali, and Colin Powell and a many more. The aim of the 100 Gates project was to beautify the Lower East side after the shutters go down on the shops each day. The 100th roller shutter was completed on Katz Deli in Sept 2016. 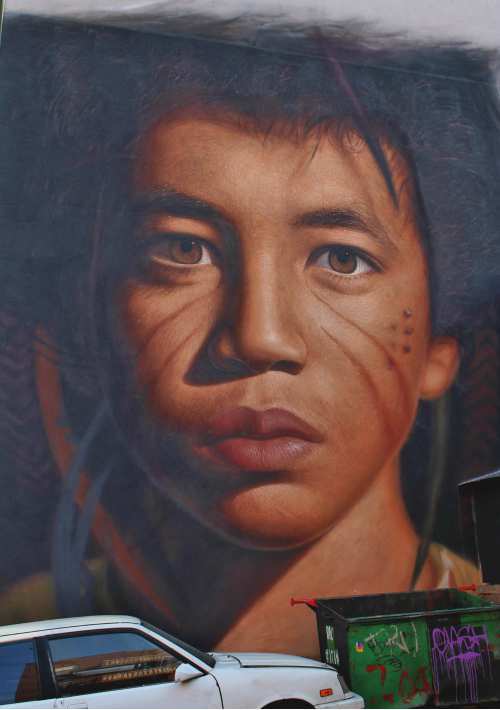 The project is said to have deterred graffiti in the area and also helped bring more traffic to some of the stores that are now being discovered on Instagram due to the murals. The best time to explore here is between 6-9am before the shop owners arrive to open up for the day. We did not manage to do this and mainly explored them late at night, consequently have very few photos of them. I found an easy to follow 100 Gates Project walking map on Foursquare you might like to try. Spending more time in Bushwick to fully explore the area – it’s been 4 years since we visited that part of town so I am sure lots has changed. 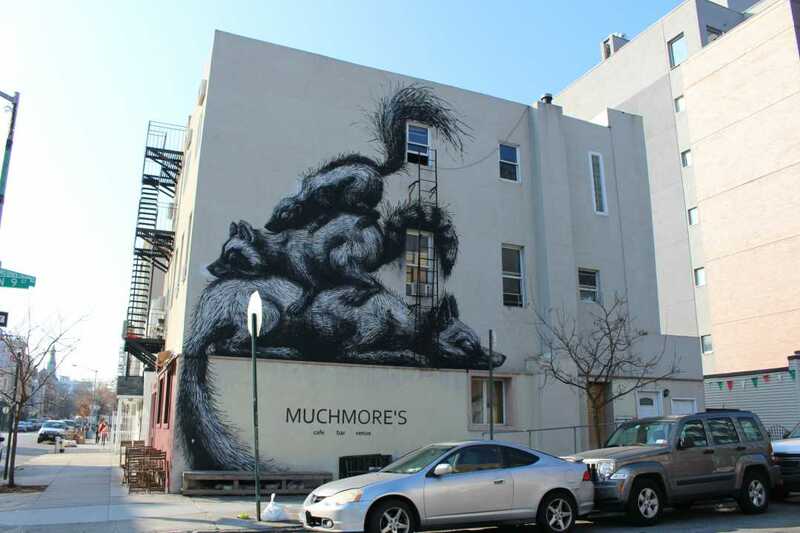 Have you got a favourite artist or mural in New York?